To commemorate 110th birth anniversary of late Walter O’Malley (1903-1979), former Dodgers owner, the Baseball Hall of Fame opened a special exhibition “Baseball in Japan and the O’Malley family” on June 29 and Walter’s son, Peter O’Malley (75), joined ribbon cutting with Commissioner Ryozo Kato and Renzo Ishii (81), former manager of Waseda University baseball club. Commissioner Kato presented the guest of honor with letters of commendation for the lasting friendship between Japanese baseball community and his family. The exhibition displays valuable memorabilia borrowed from O’Malley family and will last till July 15. In accepting the recognition, Peter O’Malley responded by saying that this was his 85th visit to Japan beginning with the first one in the fall of 1956 with Dodgers and will aim for a century! He is a great supporter to bring baseball and softball back to the Olympic Games and reiterated his pledge to help WBSF’s reinstatement campaign for the next 2 months. 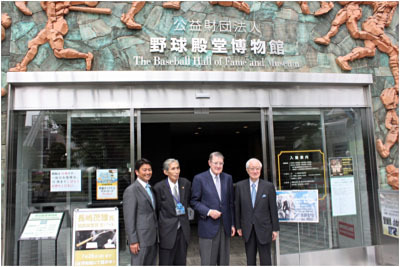 Photo by courtesy of The Baseball Hall of Fame Japan.